A history of quality in construction. Before there was Broce Broom, there was Broce Construction. 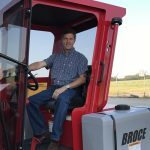 Ray C. Broce started in construction at a young age using horse-drawn equipment to help maintain roads in the 1920’s for the Kansas Highway Department. In 1937, he branched out on his own buying a truck and starting his own company, Broce Construction. 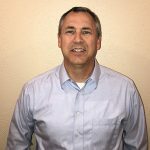 From there spanned a successful career working on a variety of highway projects in Oklahoma. 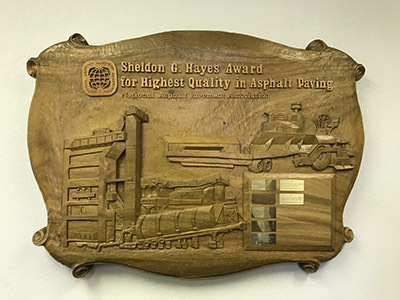 In 1971 the National Asphalt Pavement Association (NAPA) started awarding companies with an award called the Sheldon G. Hayes Award. This award is given to the company that demonstrates exemplary quality in construction. The award is not easy to acquire. When submitted, the projects are carefully evaluated by engineers of the National Center for Asphalt Technology. During the second phase of the submission review, an independent firm conducts a smoothness test on the asphalt used as well as visit the project site. Lastly, an independent pavement expert visits the site and does a visual inspection of the pavement.